I believe this whole heartedly, Creativity IS our nature! The drive to create in many and varied ways is deep in our nature as humans. It’s this drive, that I believe to be inherent in each of us, that inspires me to try my best and create a little something each day. It’s this drive that pushes me to try new things and new ways of approaching the familiar. It’s this drive that encourages me to pick myself up when things don’t go as planned and try again. It’s this drive that inspired me to create this print – my first art print in 20 years! And it’s this creative drive inside you that I hope this image sparks to action, on every path you choose for your life! Let’s take a closer look at Creativity! The prints themselves are printed on actual maple veneer about the thickness of card stock. It’s not paper printed with wood grain, it’s actual wood! It feels pretty amazing to hold in your hands. The wood grain on each print is slightly different, but equally as beautiful, making each print individually unique. The grain shines through the printed flower illustrations and shimmers in the light. See the beautiful woods grains! The flower illustrations were originally created in watercolor. Notice how lovely the printing captured these watery subtleties from the original paintings. As far as the words, Creativity is Our Nature, the images came easy, but the words were a little more tricky. I knew the theme of what I wanted to say, but just couldn’t strike the right words. Simplicity can be so challenging sometimes! I was thinking really hard on what I wanted the print to say which was making me get too stuck in my head. So one night, I went for a walk on the beach with my partner Sean, and as we were walking and I was tossing out lots of ideas, this came out of my mouth and I knew immediately it was the one! Sometimes it takes a little physical movement to get the mental movement going too! All the brushwork in the paintings shows in the wood print! I decided to make a small run of these prints, because being my first print in so long, I felt a little unsure of how people would respond. So, this is a run of 10 prints and each print is signed and numbered. I don’t know if I will print them again or not, so if you feel inspired you may want to act on that feeling. This original run also comes with an authenticity card should you be into art collecting. The prints are sized 11×14 inches and look great framed or tacked right up on the wall! Don’t worry, I didn’t cut them! just thought they looked nice on this vintage green paper cutter! They are available in my Etsy shop while supplies last! This picture really shows how nice and thin the veneer is. The wood is nearly translucent. I think that aspect gives the print a luminosity that really makes the veneer grains shine and printed colors glow! Want to get one of these inspiring prints for yourself or your favorite person? It’s easy, click here & get them in my Etsy shop! & the shipping prices aren’t too bad for outside the states either! What is your favorite way to spark creative inspiration? Share in the comments below! Share pics of your creative endeavors #wingswormsandwonder on instagram! 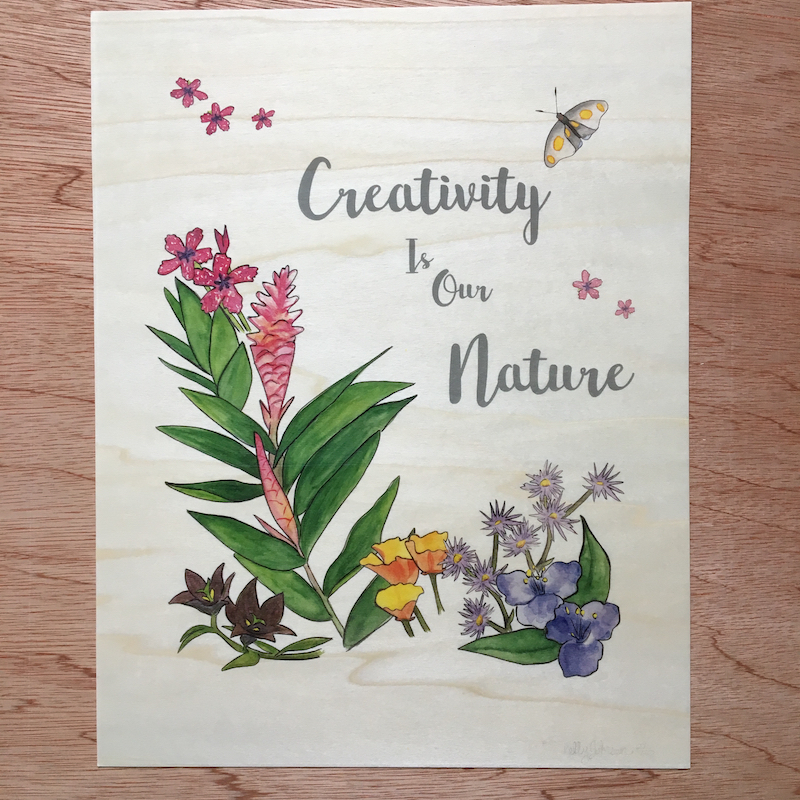 Order the “Creativity is Our Nature” prints here while supplies last! Get a discount with the code holiday2016 at checkout! Looking for nature inspired gifts to make or experience for all the winter holidays? Check out the Give Nature for the holidays blog feature! Print off your coloring checklist of ideas and watch the replay of the live video chock full of ideas and elaborations on how to create the list of ideas!